With many of the more dramatic elements of Mayor Mike McGinn’s proposals to overcome a $56 million general fund deficit in 2011 scaled back, the Seattle City Council on Friday put most of its final touches on the 2011-2012 City Hall budget. 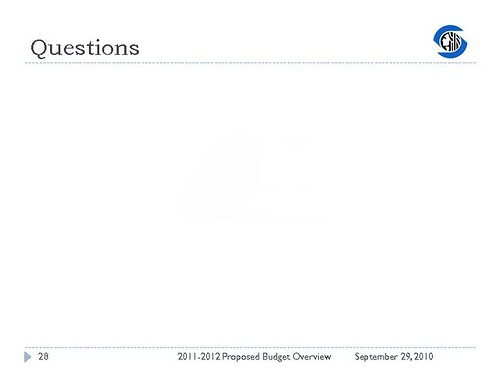 You can view the executive’s proposed budget in the attached PDF. We’ve included a summary of the services and positions restored by the City Council, below. The summary items come form a Council media release so commentary represents their position on the restored items. Thanks to the cutbacks, Seattle’s 2011 general-fund budget will come in around $895 million, about 1% lower than 2010, according to the Seattle Times. The cuts for 2011 and 2012 won’t be anything new. The city began its cutbacks this summer to get a head start on righting a quickly listing general fund. More than 50 positions were planned to be eliminated this summer. 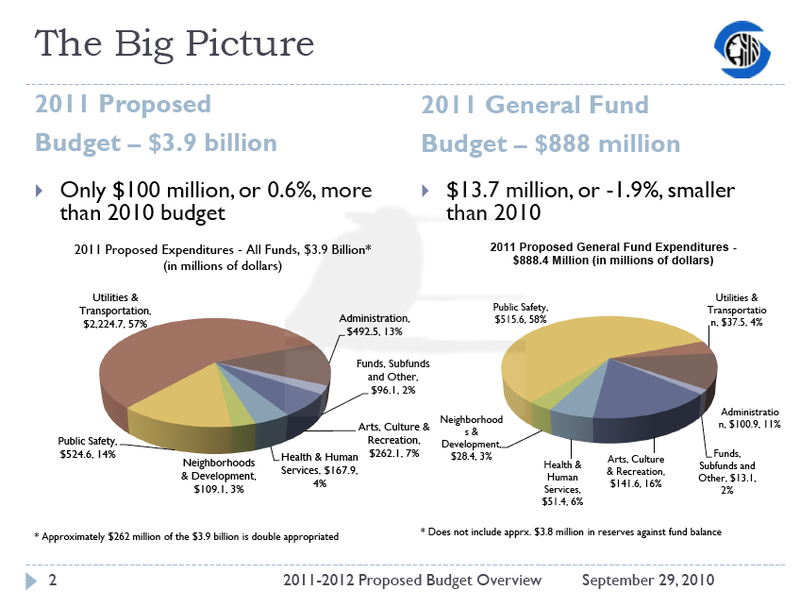 In all, the mayor’s plan called for the elimination of about 300 city jobs for the 2011/2012 budget process. No updated count was included in the Council’s summary but you’ll see a few positions explicitly restored. One City of Seattle role that received a fair amount of attention in the proposed cuts were the six neighborhood district coordinators slated for elimination. The Council was able to restore funding for three of those positions. We need to check in to find out if the Capitol Hill coordinator made the cut. Changes to the way Seattle structured its revenues related to parking were one of the most significant areas of influence in the Council’s reshaping of the planned budget. The mayor’s proposals related to paid parking were scaled way back by the Council’s actions as a commercial parking lot tax was rejected, paid Sunday parking was not implemented and a proposal to extend paid parking to 8 PM wasn’t acted on so won’t be happening any time soon. The Council is expected to formally adopt the 2011-2012 Budget on November 22, 2010, at 2:00 p.m. in a Full Council meeting in City Hall chambers, 2nd floor. Provides funding to restore a total of 75 drop-in hours at five Community Centers. Restores $300,000 per year to the City’s Neighborhood Matching Fund, which has provided critical support to community projects across the City. Provides sufficient funding to avoid the layoff of three of the six neighborhood district coordinators that would have been terminated under the Mayor’s budget. Provides nearly $200,000 in funding to establish a full-time winter shelter in City Hall and to address increasing costs experienced by existing shelter providers. Restores 2010 funding levels for human services-related policy advocacy and for non-profit capacity building. Restores almost $150,000 to continue subsidies that allow low-income offenders to participate in domestic violence batterer’s treatment programs. Preserves sufficient funding to implement the Seattle Police Departments Neighborhood Policing Program. Restores funding for Crime Victim Advocates proposed to be cut in the Mayor’s 2011-2012 proposed budget. Adds $20,000 per year for the Safe Havens program, which provides a safe visitation center for the children of families affected by domestic violence. Sets a maximum hourly meter rate of $4.00, a minimum rate of $0.75. Rejects the Mayor’s proposal to increase the commercial parking tax from 12.5% to 17.5%, while still providing the Seattle Department of Transportation $2.2 million in additional funding per year. Directs this additional $2.2 million per year in funding to support critical transportation investments, with an emphasis on infrastructure that serves pedestrians and bicycles. would that unnecessary expenditure of $2.2 million pay for? That’s inexcusable to be buying bike lanes and worthless green boxes on the street when crime is on its way up.